More coverage from our weekend at Walker Stalker Con London this time with a panel consisting of Ross Marquand, Avi Nash, Josh McDermitt & Seth Gilliam. The laughs came thick and fast on this panel with the comradery between the actors instantly recognisable. 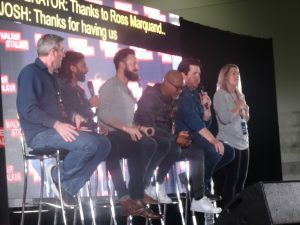 As well as appearing at this panel these actors and more were available during the weekend for autographs, meet and greets as well as photoshoots with fans. Keep up to date with our Walker Stalker Con London coverage by following us on Twitter.